It's my turn to post a project over at Country View Crafts Project Blog today. Inspired by Tim's March tag I used his technique of adding gold textured embossing to the background and layered other elements over it. When finished I added this to my collage and mixed media album. The colours and dreams of dragonflies in the garden gives me the promise of some warm lazy days near a pond or our local canal and perhaps a picnic with the grandchildren. We are very lucky to have a very large park which we call The Lodge near us which backs onto the Basingstoke Canal and is perfect for walks on a lovely summer day. There are more details at the CVC project blog if you would like to see them. OMG, Brenda this is stunning! I love all the layers there and a fabulous texture! The colors are amazing and your dragonfly is just fantastic - my favorite! Thank you for the inspiration! Hi Brenda, gorgeous card there's something about turqoise it just always looks fantastic and works so well with other colours too. 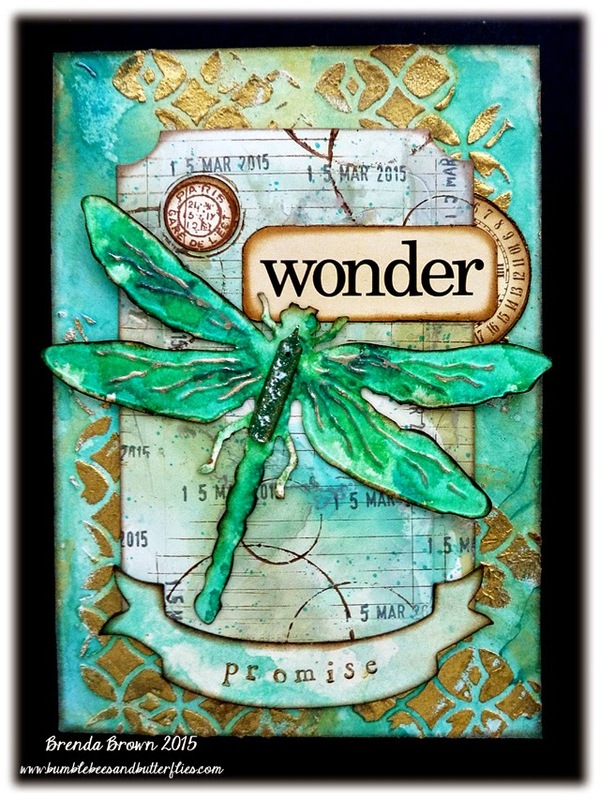 The dragonfly has always been one of my favourites from the Tim Holtz range so what more can I say... just love it all! Gorgeous piece, Brenda. 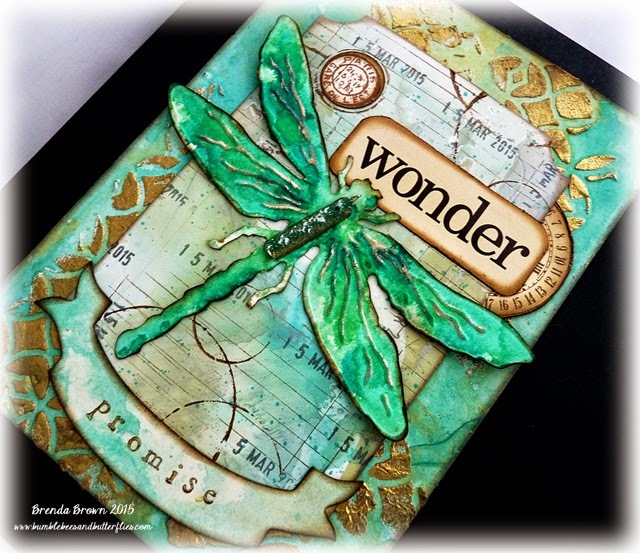 Love the colours and the dragonfly, plus all the gold embossing. Sure hope the weather warms up soon here. The weather man keeps promising, but it seems to keep getting pushed out, day by day. So tired of winter garments. This is so beautiful, Brenda! I love the colors and touches of gold. Pretty dragonfly, and a gorgeous background, Brenda! I love this! Such a beautiful and colourful make Brenda. Wonderful details and the gold stencilling looks amazing, adding real richness to the colours. What a gorgeous glow - I love your gilded dragonfly and that fabulous golden texture in the background. Just saw this over at CVC, beautiful Brenda! Love the embossed background and the reinker background page under your lovely dragonfly is the perfect backdrop.